The motor unit is an intricate pluricellular structure in which motor neurons and muscle fibers are dependant on each other. Its formation and maintenance depend on continuous trophic, electrical and mechanical cross-talk between muscle and motor nerve. 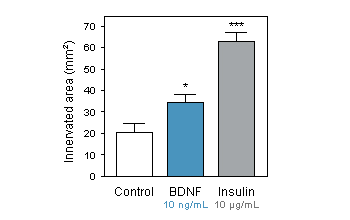 This unique expertise of NEUROFIT allows us to observe motor neuron-dependent myocontraction and thus evaluate the ability of compounds to improve spinal motor neurons functionality. This model could be used to evaluate neurotrophic activity and more generally therapeutics for neuromuscular diseases. The ability of compounds to improve spinal motor neurons functionality can be assess by determining their ability to innervate and to induce muscle innervation in a coculture of rat spinal motor neurons with human muscle. This model could be used to evaluate neurotrophic activity of compounds. 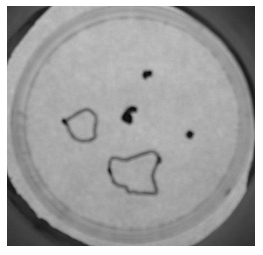 Low magnification picture from a Petri dish in which 5 explants are initially placed. 3 weeks after, 3 explants, marked with a dot, were not able to produce an efficient innervation and the 2 latter explants innervated large muscle areas which were delimited by a line. 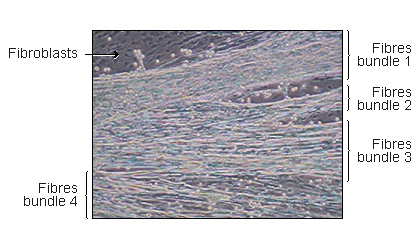 Muscle derived cells, mainly myoblastes and fibroblasts are cultured in monolayers. Immediately after myoblaste fusion, whole transverse slices rat embryos spinal cords with dorsal root ganglia attached are placed on the muscle monolayer. After 24h neuritis are observed growing out of the spinal cord explants. They make contacts with myotubes and induce the first contractions. Quickly thereafter, innervated muscle fibres located in proximity to the spinal cord explants, are virtually continuously contracting (see movies on our website). Innervated fibres are morphologically and spatially distinct from the non-innervated ones and could easily be distinguished from them (Askanas et al., 1987). 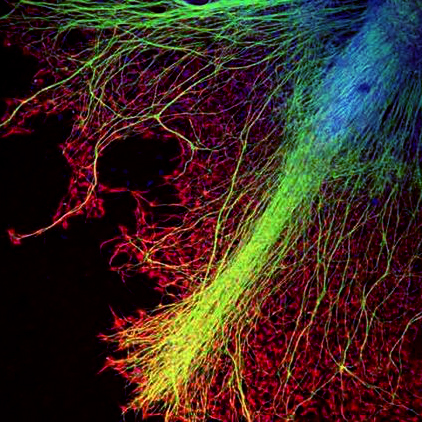 The ability of a molecule to promote spinal motor neuron survival, neurites outgrowth and/or neurons functionality can be evaluated by measuring neurite sprouting (number and length), innervation rate (number of spinal cord-muscle couple which lead to an innervation), innervation area (surface covered by innervated muscle fibers per spinal cord explant), ACh receptor aggregation as well as several other parameters depending upon the mode of action of the compound (Braun et al., 1996). 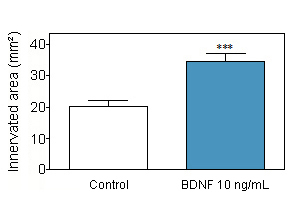 BDNF at 10 ng/ml increases the innervate rate from 20% under control condition to 25% with BDNF and augments the surface of skeletal muscle innervated by an efficient rat spinal cord-human muscle coupling. 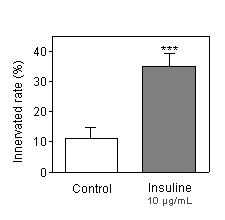 Insulin at 10 µg/mL increase the innervated rate. Measurement of electrophysiological parameters such as SNCV and CMAP and fiber morphometry.